We’d love your help. 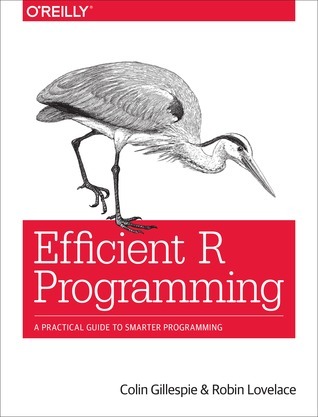 Let us know what’s wrong with this preview of Efficient R Programming by Colin Gillespie. To ask other readers questions about Efficient R Programming, please sign up. 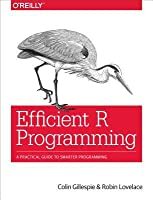 This is another R book I would definitely recommend to those who are new to R. As an experienced useR, I already know most of the information in this book, but I nevertheless learnt some cool new tricks I didn't know about before, such as the rio package for file IO and automatically formatting code in RStudio. Now I really love RStudio more. Really useful and important read for R programmers. Saving time is very important in (big) data science and Colin Gillespie makes a fair point in refering it throughout the book. Luckily, the book is not only the representation of the author to identify this recurring problem, it is also filled with suggestions on how to speed up your coming across different steps - from the actual typing of the keys to the optimization, featuring two very interesting chapters on sharing your code and making it available and on how to correctly (and effectively) l Saving time is very important in (big) data science and Colin Gillespie makes a fair point in refering it throughout the book. Basically a worse version of content covered in Advanced R, and R for data science (Wickham's books). Colin Gillespie is the author of This Changes Everything and Time One: Discover How the Universe Began. An Australian-born physicist, Canadian lawyer and writer, he is the author of some 30 scientific research publications in quantum physics, biophysics, neurophysiology and radiation biology. Colin has also written on social planning, class actions, aboriginal law, environmental management and indig Colin Gillespie is the author of This Changes Everything and Time One: Discover How the Universe Began. Colin has also written on social planning, class actions, aboriginal law, environmental management and indigenous constitutions.